The brick is the basic building block of architecture, popular because it is modular, has a simple design and is both easy to make and use. In fact, the humble brick is used in more than 80 percent of global construction, according to architect-turned-scientist Ginger Krieg Dosier. But this classic building material has a heavy environmental toll, Dosier said in a June 2013 TEDx Talk: It is estimated that annual global brick production releases 800 million tons of carbon pollution each year. “This is a lot of pollution from one simple material,” she said in her presentation. 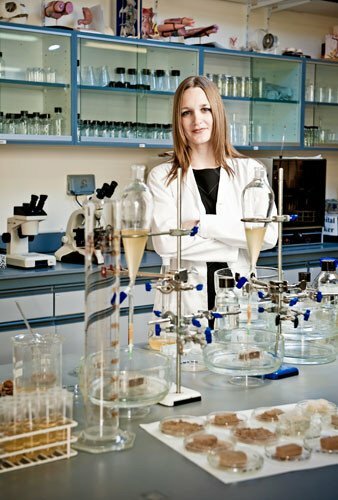 Inspired by strong natural structures like seashells since she was a child, Dosier invented a process that uses bacteria to “grow” bricks and releases virtually no carbon emissions. Dosier, founder and CEO of biotech startup bioMason, was the winner of last year’s Dutch Postcode Lottery’s Green Challenge -- one of the largest and longest-running sustainable business plan competitions in the world. In its eighth year, the challenge is open to startups and entrepreneurs from all over the world to help them bring environmentally responsible products and services to the mass market. The winning business plan will receive €500,000 ($680,000) to advance its product or service, while an additional €200,000 ($272,000) will go to one or two runners-up. “With the prize money, we will be able to achieve significant results faster and launch our sustainable bricks on a large scale. This is a huge encouragement,” Dosier said last year upon winning the Green Challenge. Dosier became interested in developing a more environmentally friendly brick in graduate school, where she read the book, “Biomimicry,” which advocates for using natural designs and processes to solve human problems. Dosier came to believe that the next greatest material revolution would be in durable structural cements similar to ones made in the ocean like coral reefs and sea shells. “Nature can produce materials with greater strength than [those made by] our manmade processes and with less energy, without polluting the surrounding environment,” she said in her TEDx Talk. For example, she said, a spider can weave a web with silk stronger by weight than manmade steel. When Dosier learned that bacteria was actually responsible for the formation of some sandstones – by producing a glue to bind together the grains of sand – she began experimenting with bacteria in a make-shift lab in the second bedroom of her apartment. “It took years and many mistakes to grow a strong, durable, full-scale brick,” she said. Now Dosier and her team at bioMason have perfected the brick-growing process: They start with sand – a preferred material because of its overwhelming global abundance, she said. Next, they make the cement that glues the sand together by creating a liquid solution that includes the bacteria, food for the bacteria, sources of nitrogen and calcium, and water. This solution is applied over a bed of sand in molds and repeated for five days until a solid bio-cement material is formed. Once the bricks are dried, they are ready for use. The process also produces few waste materials, Dosier said. Once the bacteria’s food and water is cut off, they simply die. The liquid solution, which is applied to the sand through an irrigation system, is recycled in a closed-loop process. This not only saves water, but also captures the natural byproduct of the bacteria: a valuable natural fertilizer that can be marketed. Producing bioMason’s sustainable bricks is very different than the conventional process to make clay bricks, in which clay and sand is mixed together, formed into the shape of a brick and fired at 2000 degrees Fahrenheit for 3-5 days – producing a significant amount of greenhouse gases. Since winning last year’s Dutch Postcode Lottery’s Green Challenge, business is booming for Dosier and her team at bioMason: They’re hiring additional team members, talking to potential customers and moving to a space three times the size of their original incubator to accommodate their growing staff and expand their prototyping systems. They are also working on a pilot order for a few thousand brick pavers that will be used in a pedestrian walkway in a high-profile architecture project. Interested in entering the Dutch Postcode Lottery’s Green Challenge? To be eligible for the Green Challenge, a product or service must reduce greenhouse gas emissions and be ready to enter the mass market within two years. A detailed business plan and elevator pitch is due midnight (central Europe time) on June 3. Learn more details about the competition here.